This chart was created with sixth graders. They were working on argument essays that had at least two distinct sides. When we made this chart students had planned their essays and were beginning to draft their introductions. I wrote the title on the chart and asked students what a counterclaim was. We spent a few minutes discussing the term and ended with the notion that this was the opposite side of the issue that the author was writing about. Then, I added each sticky note and discussed the sentence starters. I asked students to discuss which one they like best and why. Students generally begin to talk about why one is ‘better’ than the other. This can lead to discussions of tone, audience, formality, and purpose. There are multiple and varied opinions about the shift from opinion writing to argument writing after fifth grade. Many people see these as drastically different types of writing, while others treat them as synonymous terms. I tend to fall in the middle. Many of the same teaching points exist for both types. One of the clear differences that I see is the need to acknowledge counterclaims when writing arguments. Acknowledging the counterclaim is not exclusive to argument writing. Students who are writing opinions can use them to build a stronger paper as well. Note that this chart is simply about acknowledging a counterclaim, not developing it thoroughly or refuting every aspect. 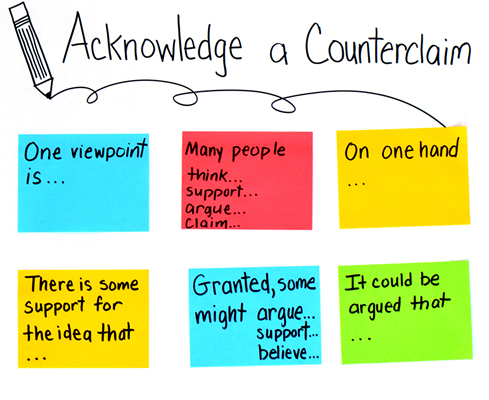 You may ask students to go further and outline counterpoints or simply acknowledge and refute the counterclaim. This chart is featured in Chart Sense for Writing.